The ever-controversial Shakur caused a stir in 1993 when he started trashing legendary music producer/icon Quincy Jones in the press for marrying a white woman. Rashida Jones, one of Jones' biracial daughters who is best known for playing Karen Filippelli on The Office, wrote a letter in response to Pac. According to the book How Long Will They Mourn Me? : The Life and Legacy of Tupac Shakur, some time later Pac was at a party and he thought he saw Rashida and ran up to apologize to her. But it turned out it was actually Rashida's older sister, Kidada. Pac must have delivered one hell of an apology because next thing you know he was having dinner with the Jones' family and dating Kidada. 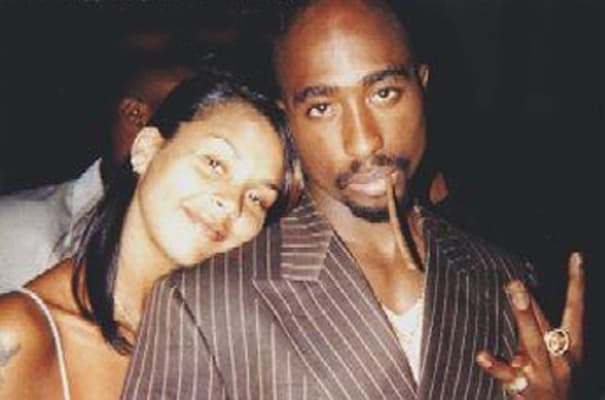 Although Pac was known to have been with many other women, Kidada stayed with Pac and it's a long-standing rumor that they were engaged at the time of his death. In fact, according to IMDB, he was on his way to see her the night he was fatally gunned down in Las Vegas.